Sadly, all good things must eventually come to an end. With this post, W. David Marx’s month-long look at the work of monumental Shibuya-kei act Flipper’s Guitar concludes – but, here at Memories of Shibuya, we swear we’ll never forget the feeling, even as we say goodbye, goodbye. (Evidence would also suggest that it’s still raining hard in the highland). In Spring 1991, Flipper’s Guitar charted a new musical course for Japan with the sample-heavy, psychedelic dance pop of “Groove Tube”. 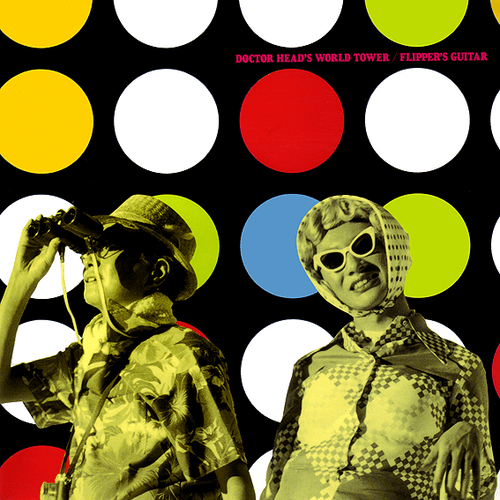 Their third and final album Dr. Head’s World Tower came out in July 1991 and further expanded this formula into a tightly-sequenced album. Oyamada and Ozawa pulled their new songs together under a single and slightly-peculiar theme — the Monkees’ 1968 film Head. This influences starts with the album title. The Japanese title is “ヘッド博士の世界塔”, and while their English translation Dr. Head’s World Tower is technically correct, hakase (博士) connotes more “PhD” than “medical doctor.” For those who have not seen Head — written by Jack Nicholson! — the film is comic and convoluted acid trip through vaudevillian comedy, hippie insight, and McLuhanian media critique. The post-modern, fragmented, avant-garde work gave the pre-fab Monkees an opportunity to show solidarity with the counterculture. But it was also career suicide — the film was a box office bomb and started the band on its descent into obscurity. While Dr. Head’s World Tower plays skillfully with My Bloody Valentine references, Marky Mark samples, and a nearly identical copy of Primal Scream’s “Loaded,” the most critical moment is opener “Dolphin Song.” The title, no surprise, is a direct reference to the lysergic, symphonic Head opener “Porpoise Song.” But the song structure goes beyond “psych” instrumentation and deep into the Sixties’ love of abrupt sudden production shifts. After reflecting on four songs over four weeks, we can now answer the question — What is Flipper’s Guitar’s role in the history of Japanese music? This is easy: The band is the clear starting point of the Shibuya-kei sound. For many Japanese people, Shibuya-kei means Kenji Ozawa first and foremost, and then Flipper’s Guitar, Love Tambourines, Pizzicato Five, Original Love, and Scha Dara Parr. For foreign fans, Oyamada is the backbone of Shibuya-kei, producing Kahimi Karie, launching bands such as Citrus and Bridge, and even marrying Takako Minekawa. Yes, Pizzicato Five pioneered core parts of the genre in the mid-1980s, but Konishi and co. did not reach mass consciousness until adding Maki Nomiya and hitting it big with 1993’s “Sweet Soul Revue.” That song came from the album Bossa Nova 2001, co-produced by… yes, you guessed it, Keigō Oyamada. (See him in this goofy video.) Judging by the timeline, Flipper’s Guitar seemed to have pushed Yasuharu Konishi to do even more sampling and melodic-thievery. In the late 1980s, two young Japanese men named Oyamada and Ozawa loved obscure European indie music, made their own versions of it, and through their rise to mainstream fame, injected those influences into an otherwise closed world of Japanese pop. The success of Flipper’s Guitar and their musical offspring launched an artistic movement that not only revolutionized Japanese consumer culture but ultimately influenced the entire globe. Thanks to Flipper’s Guitar, Japan proved it could do so-called “cool” with equal acumen to the West. ← The Shibuya-kei Year in Review, part four: what was Shibuya-kei in 2014?